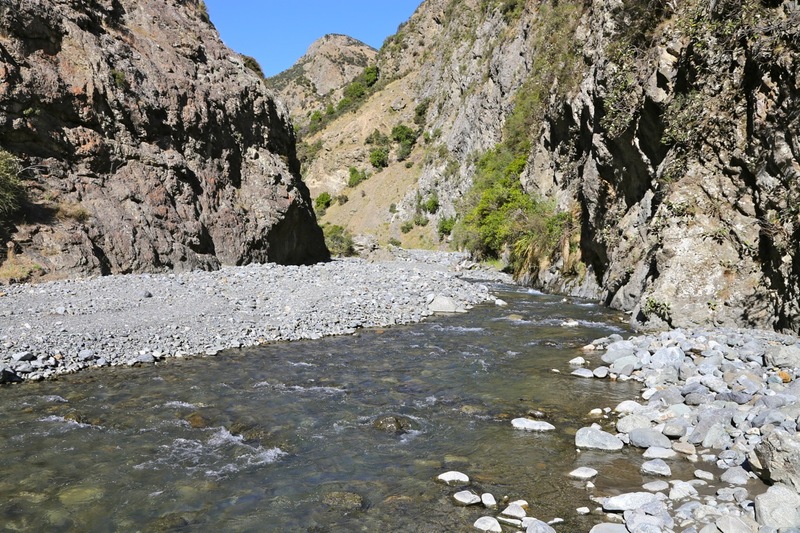 Access from the Awatere Valley Road. This is a very long dirt road connecting Hanmer Springs (Hwy. 7A, north from Hwy. 7), with Hwy. 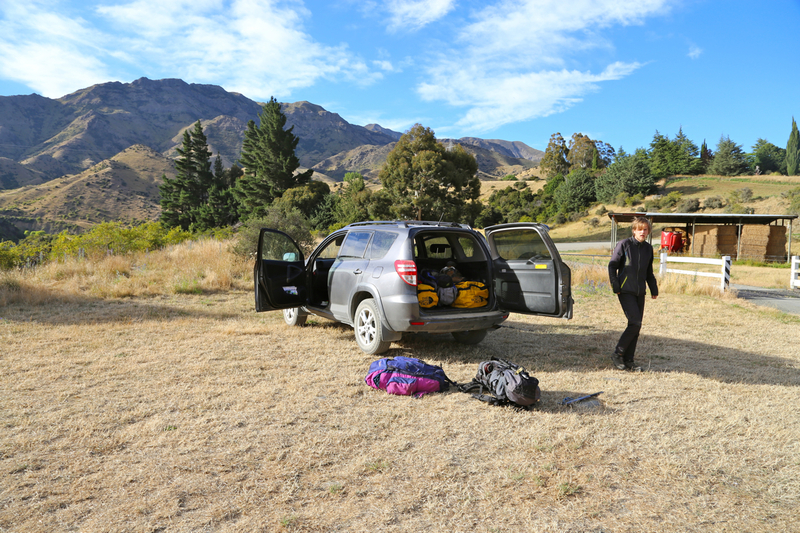 1, a bit south of Blenheim. Driving time north from Hanmer Springs is about 2 hours, from Hwy.1 going south for about 55 kilometer, a bit less than one hour of driving. 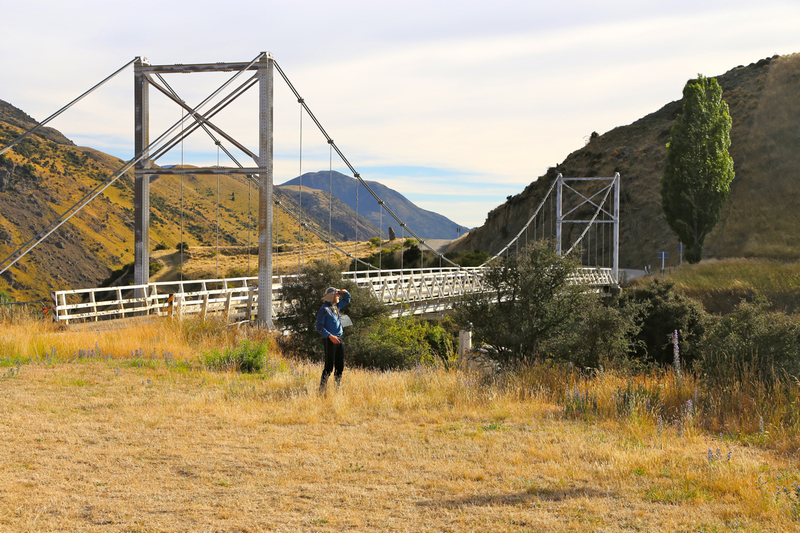 The trailhead parking is right next to a very characteristic suspension bridge crossing the Hodder river. This location is S41.88516, E173.64046, elevation about 470 meter. Hut hike. 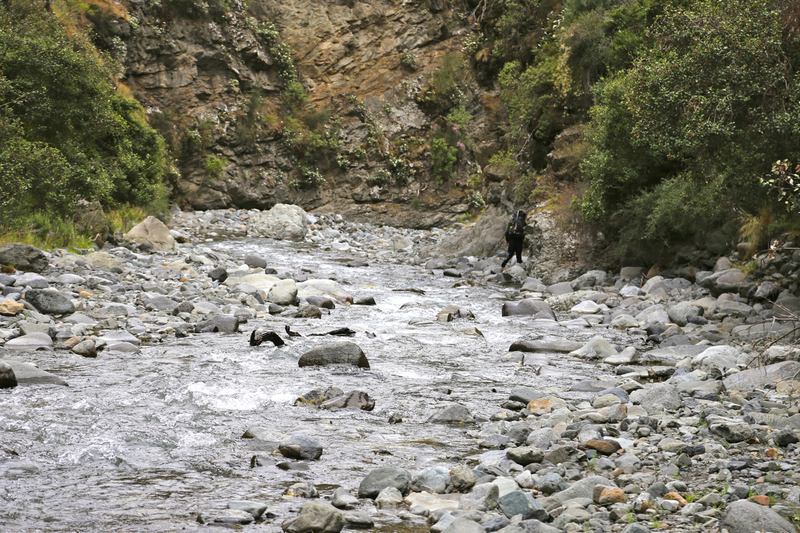 The first 45 minutes of the hike follows a farmers road that runs along (above) the Hodder river on the right hand side (as seen when going upstream). The descent to the river is marked with a cairn on the left side of the road (location S41.90110 E173.66515). As soon as you hit the river, the fun begins. It is fairly nice to hike along on the side of the river, however, the side where you may walk alternates quite frequently. It is pretty clear that this trip should not be attempted after long periods of heavy rain. The river must be crossed a bit more than 60 times before we reach the point where the route leaves the river, clmbing sharply up to our left. This point is fairly well marked with a cairn at location S41.95261, E173.65435, elevation about 1000 meter. Before getting ths far we have crossed back and forth up the river, passing two more narrow sections (lower and upper gorge), as well as a river fork, where we kept left. 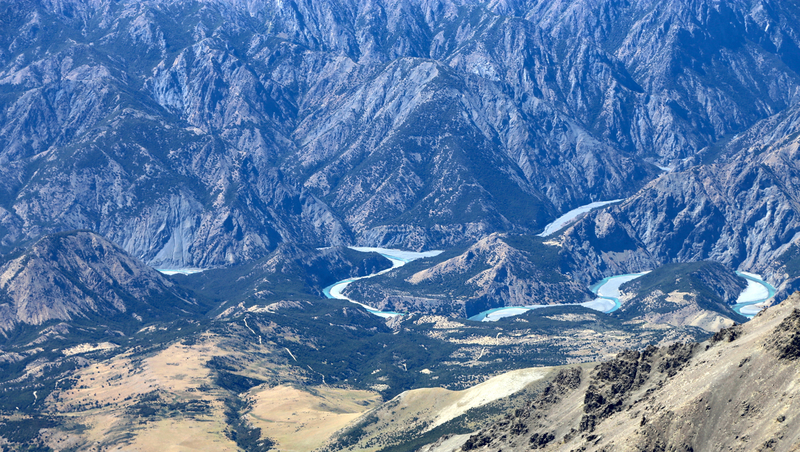 After gaining about 150 vertical meter, the bypass trail contours nicely going parallel with the river, before descending slightly to get back into the river bed which is crossed immediately. The trail now continues on the right hand side of the river and before long one may spot the two Hodder huts sitting nicely on a local, grassy bank, high above the river. 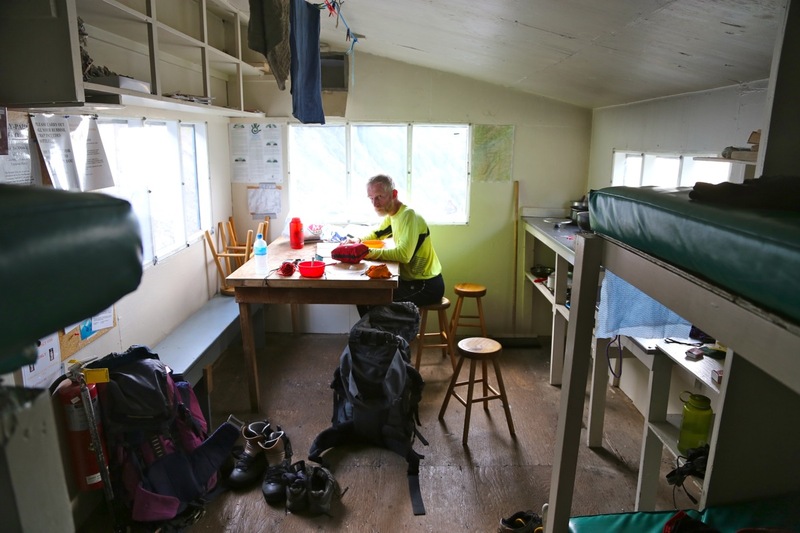 The Hodder huts are well equipped and a nice place to stay as part of this climb. 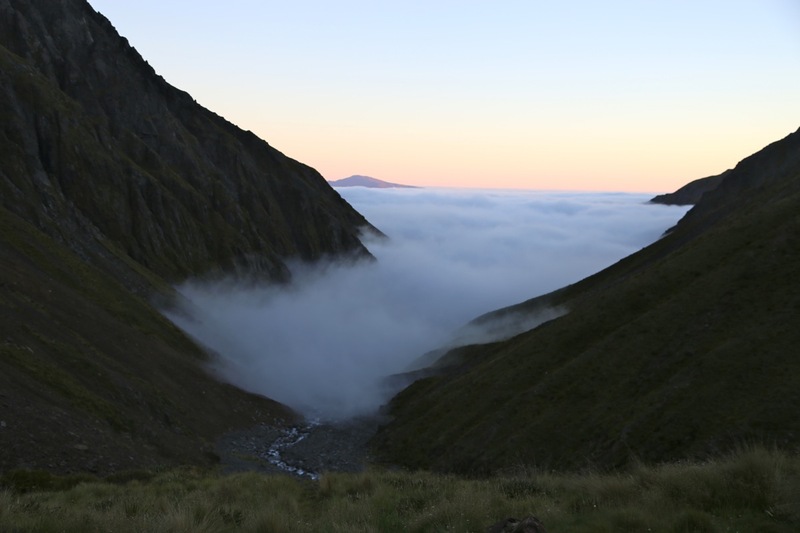 The charge (2015) is 19 dollar (NZ) per person for a night. 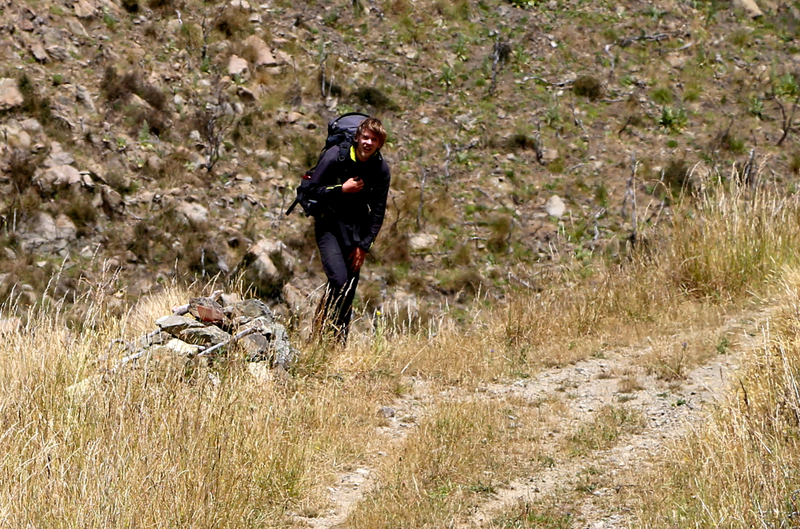 Continue uphill behind the huts, then traverse a large scree slope, all on a nice trail. The route now crosses the river, right near a fork and climbs steeply on the left side of Staircase Stream. Higher up, the trail continues up and into the valley basin, while staying left of the main drainage. Crossing below a small, but distinct waterfall, this is the last place to collect water. 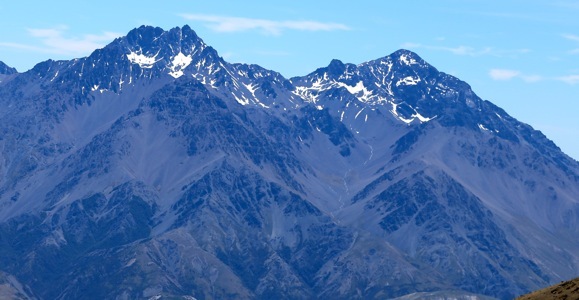 The route aims for the lowest and very clear saddle separating Tappy, left from the slightly lower mountain, Alarm, that is clearly visible up front. 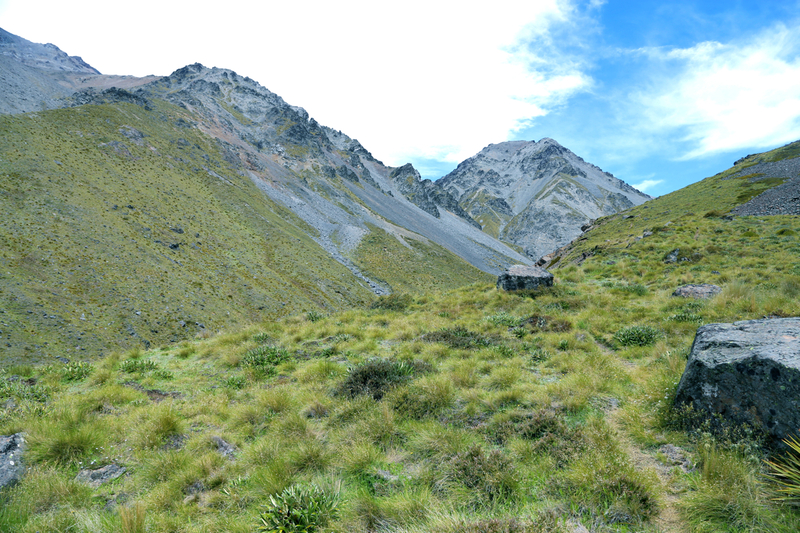 The trail gets gradually less distinct and visible, but the route is obvious and the terrain is pretty easy to walk. In the saddle, turn left. 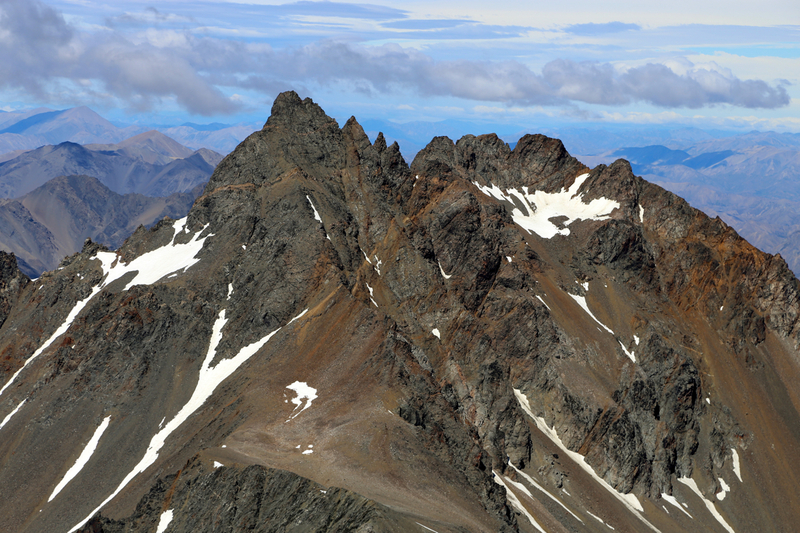 The high route along the ridge is blocked by a sizeable pinnacle. The route runs on the left side of this obstacle, then one should regain the ridge as soon as convenient. This section of the route is less clear (at least to me! 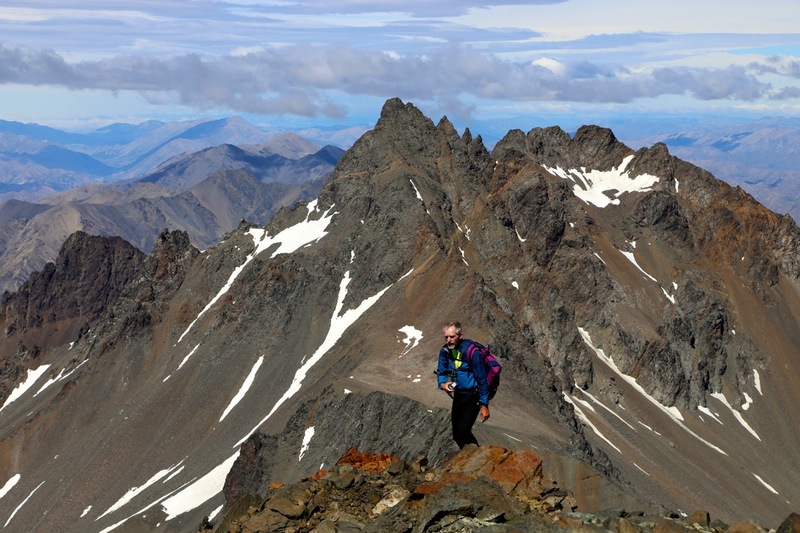 ), it may involve some traverse across steepish scree as well as some (easy) scrambling in order to regain the ridge appropriately. 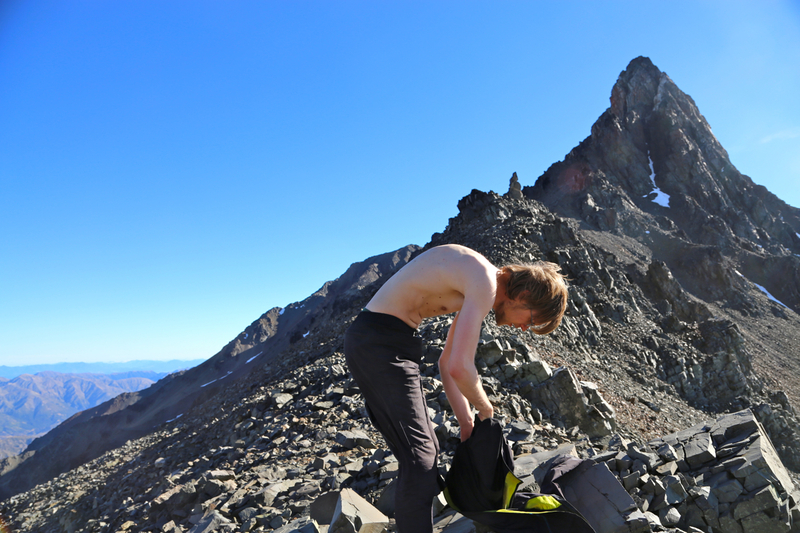 As soon as you regain the ridge, the trail is again visible and the final section from a local saddle to the summit, is quite easy. We drove north from Christchurch along Hwy. 1, and found the possibly last motel (before our turnoff) in the small town of Ward. 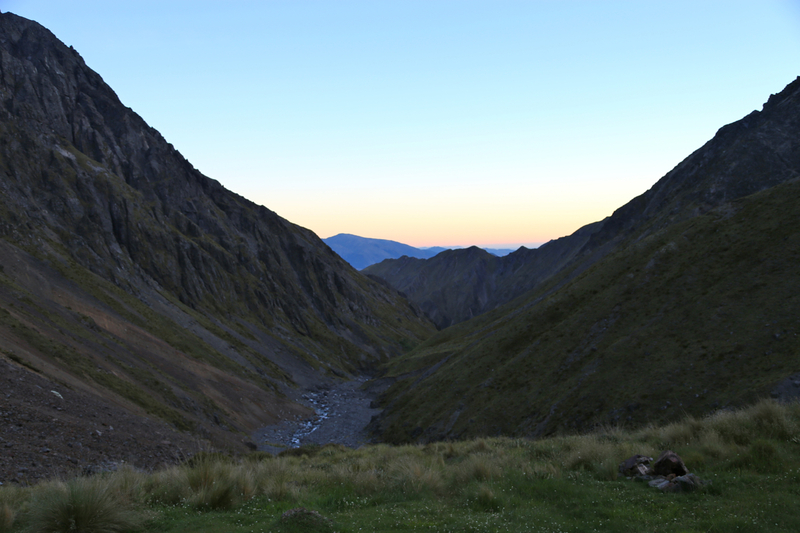 The next morning, we continued to the Awatere Valley Road, and along this road to the trailhead. We started hiking around 0830. The grassy farm road was easy to follow and a small trail provided an obvious short-cut along the way. We located the cairn showing the point to descend to the river without any difficulties. Hiking along the river was nicer than expected/feared. 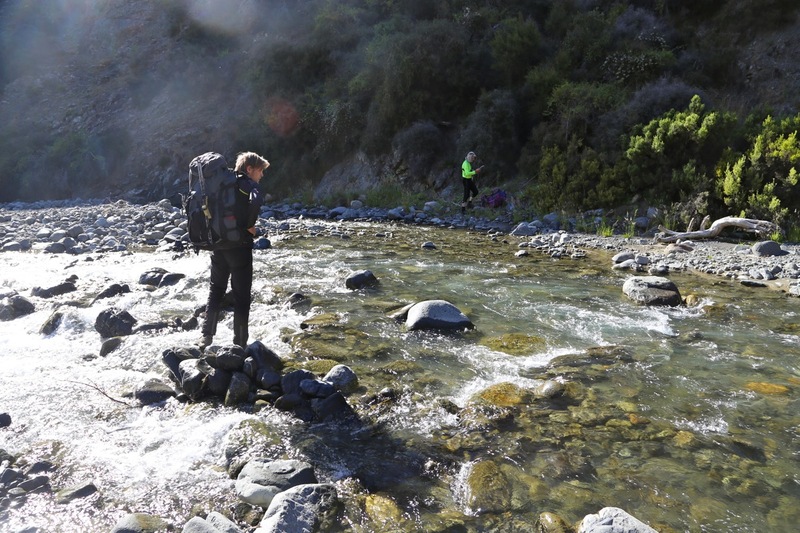 We still had the river hike on the Manakau approach in fresh memory. However, this hike had a very different flavor. This river had to be crossed many more times, but each crossing was relatively easy once you accepted that the only way to proceed was just to walk across. That is, no attempt to jump from boulder to boulder, - get wet and stay wet. The good news being that the water was far from ice cold. This hike was surprisingly pleasant, we got used to crossing the stream back and forth and we quickly lost count of how many times we had crossed. We took a rest at the location where the route (finally!) leaves the river and becomes a normal trail. The time was 1330, i.e. it had taken us about 5 hours to get this far. This bypass trail was actually quite nice and as we again descended to the river, a trail continued on the far side. A single crossing, then a pretty nice trail to the Hodder huts that were visible up on a local bank, nicely high above the river. 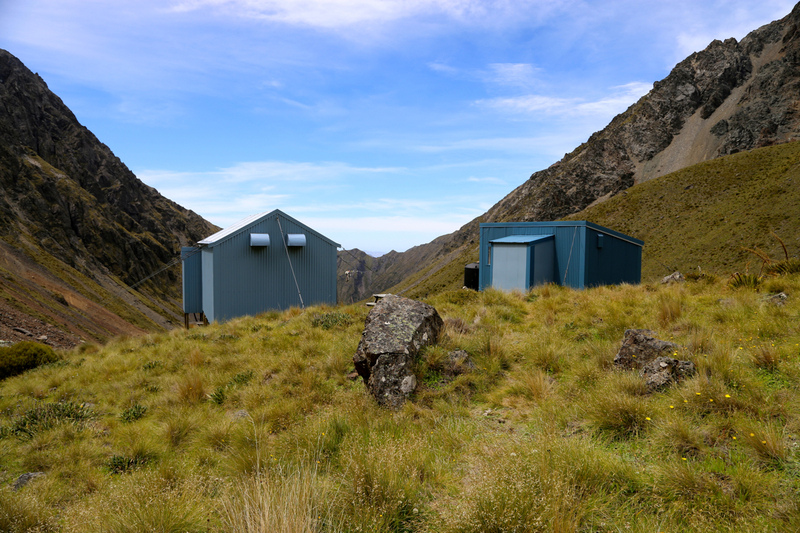 The hike to the Hodder had taken us 6:30, it was nice to arrive and the huts were in good order. Later in the evening, a group of Australians (with a guide) arrived. They moved into the larger hut as we had already occupied the smaller one. The next morning, we had an early breakfast and were on our way by 0620. The route was easy to follow since the trail runs a long way uphill. 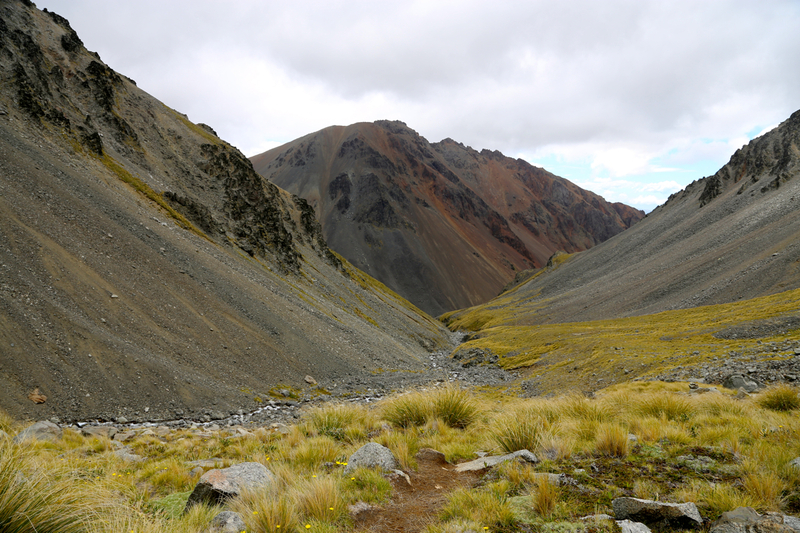 In fact, our hike was very pleasant and easy until we made the saddle between Alarm and Tappy. 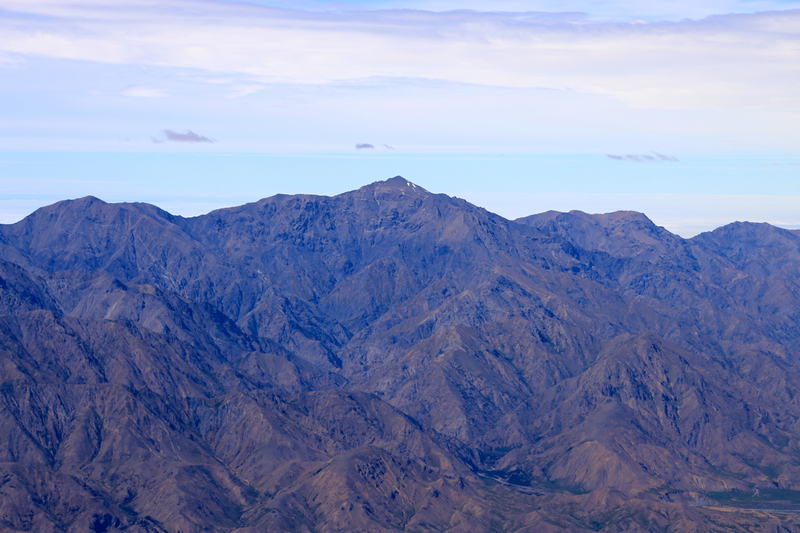 From here, we had read that one just should follow the ridge. Easier said than done, a big cliff blocked any route along the top ridge. 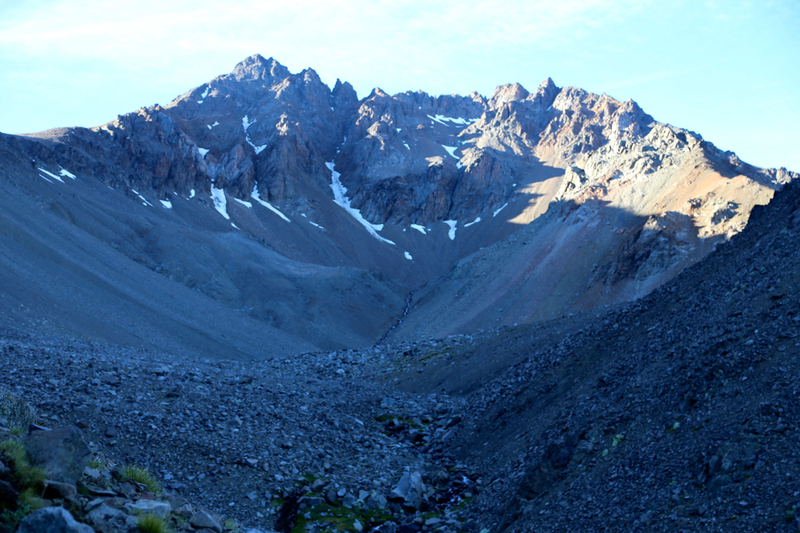 We traversed left and got into unpleasant, loose scree. A bit later, (YDS) class 3 climbing up parallel to steep, icy snow. 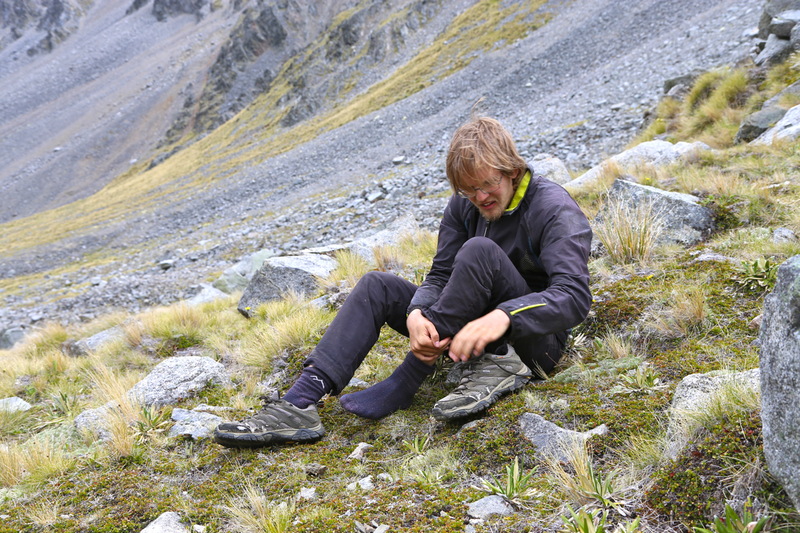 With our crampons left in the hut, there possibilities were severely limited. 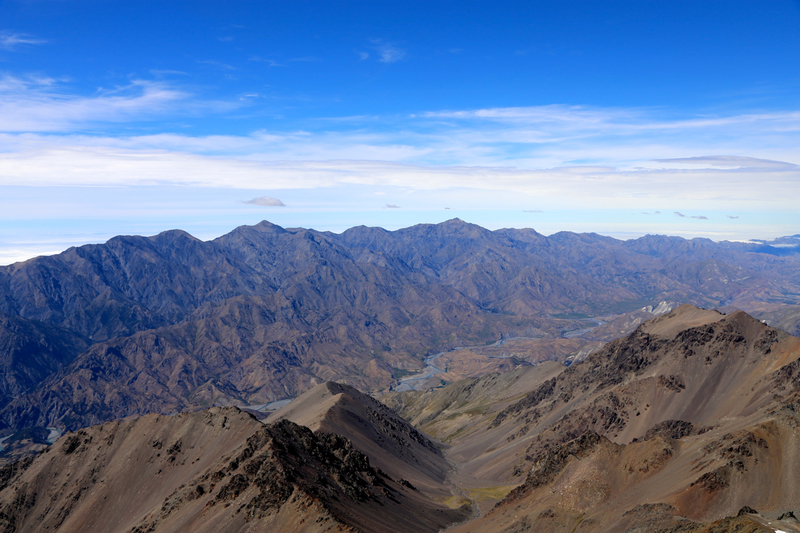 Finally back in a local col, from here, we could again see a trail and the remaining ascent was very easy. We were at the summit at 1050, so a full 4:30 from the Hodder huts. 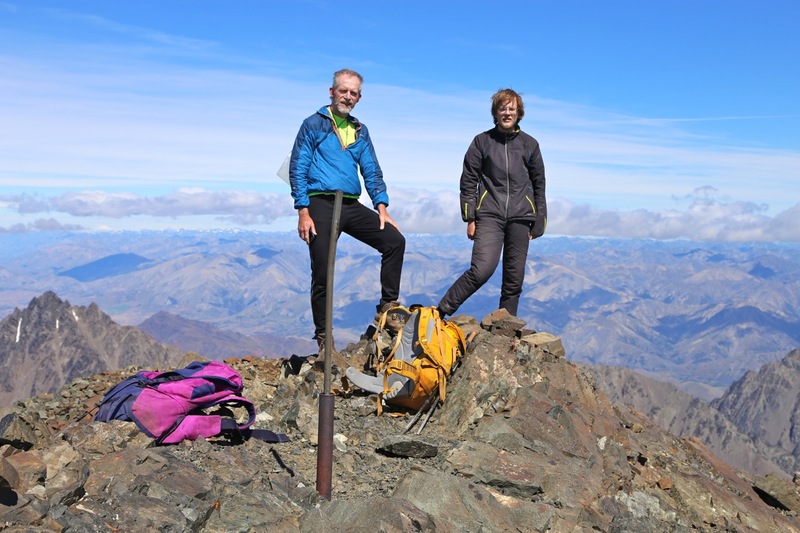 It was a fine summit and a fine day. 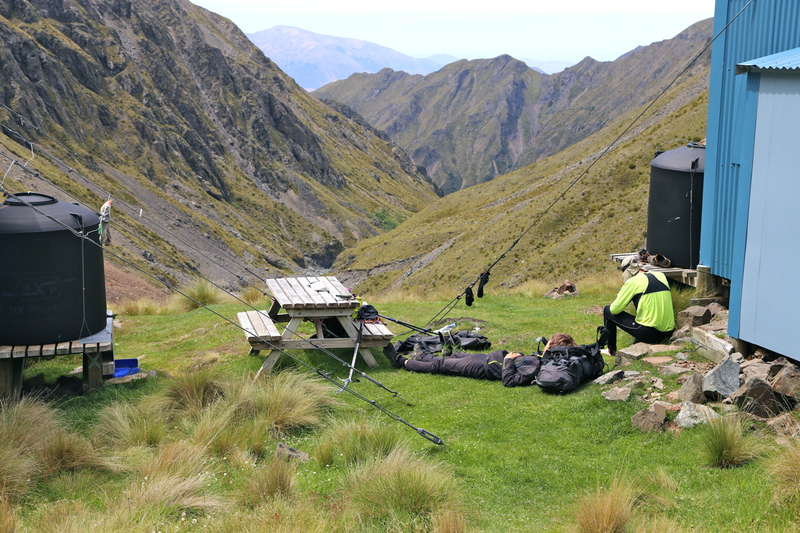 A good view down to the river separating us from Manakau that we climbed 10 days ago. We stayed on the top until 1125. We then decided to explore an alternate route back down. To reverse our route of ascent was not appealing. 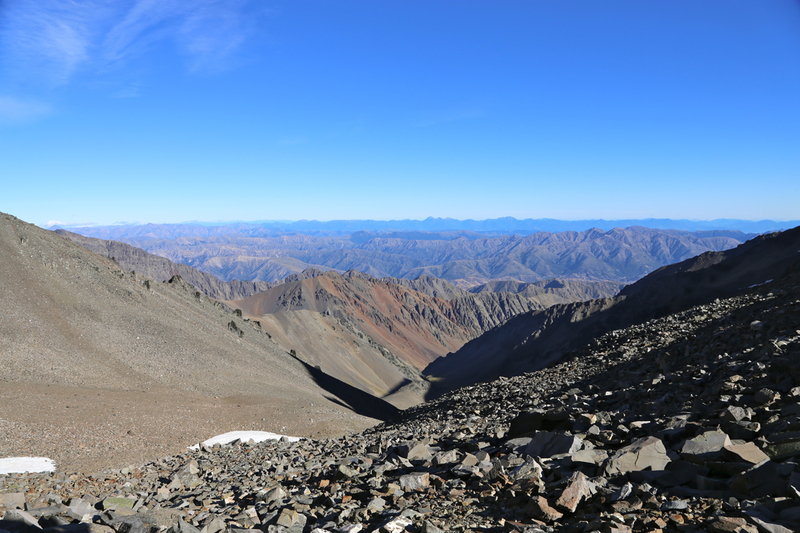 We continued along the main ridge until the second distinct saddle, From there, we descended on scree. 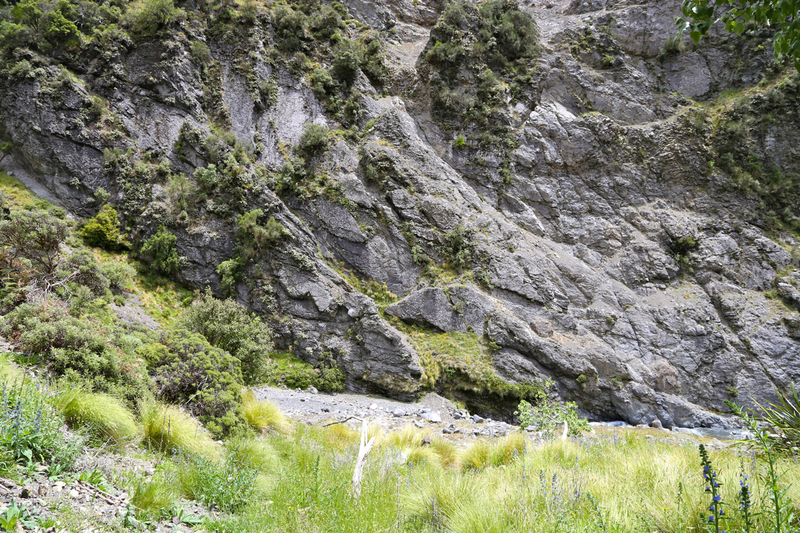 Further down, some routefinding was called for in order to avoid cliffs. 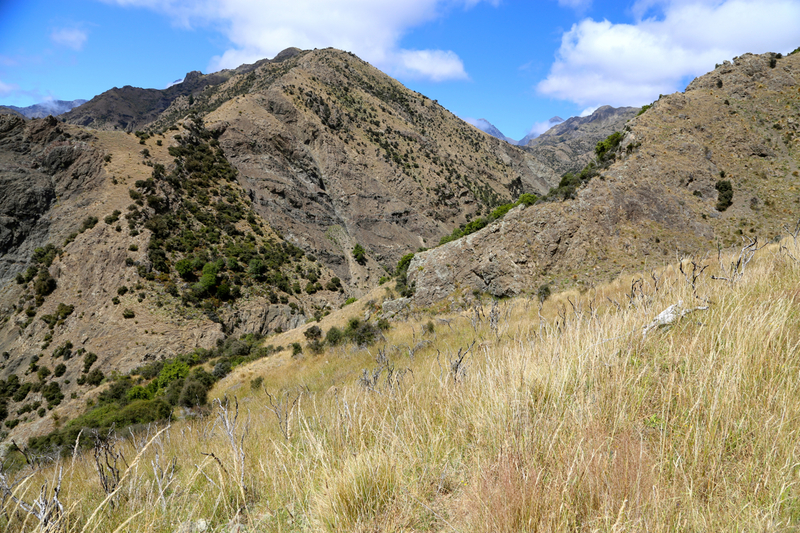 We came down well above the Staircase creek and enjoyed the final walk down to the Hodder huts. Back at 1440. The next morning, we left at 0700. A nice blanket of clouds came in our valley. 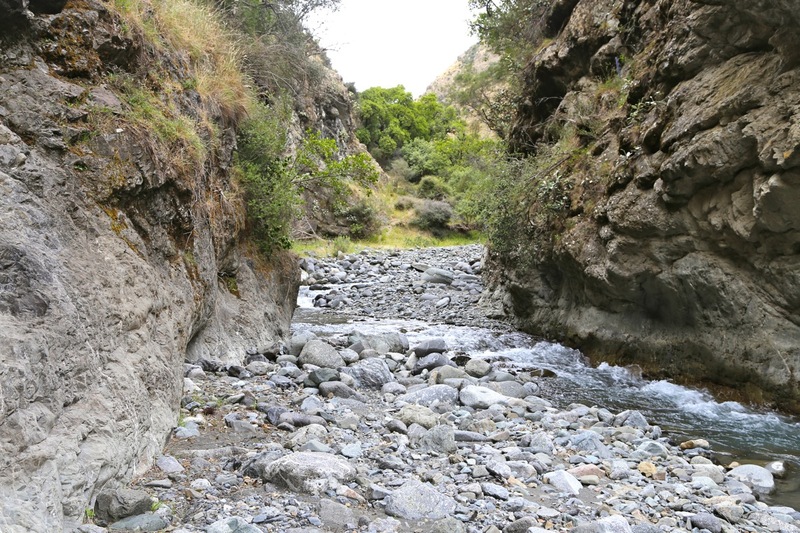 However, the clouds quickly vanished and the somewhat dry looking scenery kept changing as we walked downstream. The river was now a familiar route and we had no particular problems. We kept a good pace with all the river crossings and arrived back at the car at 1245. 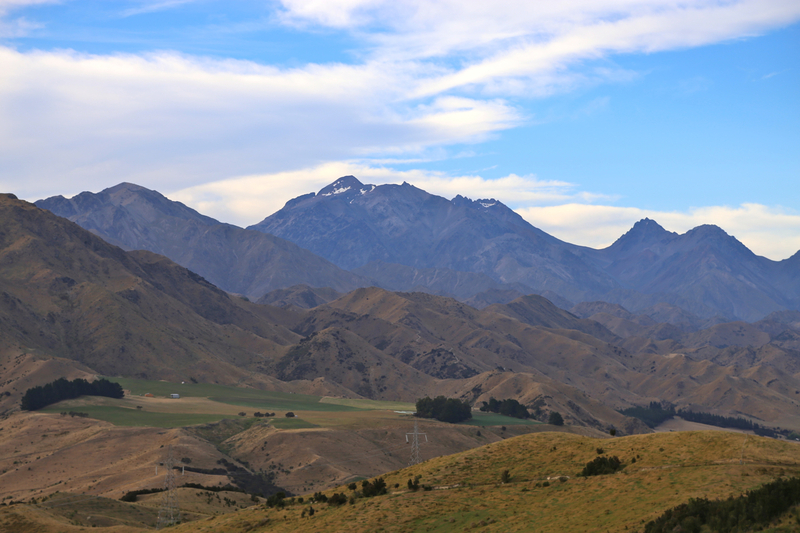 Tappy, as seen from the Awatere Valley Road.